This is a relatively early thing for Salvador Dali. The painting was written in 1926 as a present by Garcia Lorca, with whom Dali was very friendly. Subsequently, the artist painted bread countless times. He consciously made bread his brand: “invented the Columbian egg – the bread of Salvador Dali,” in his own words. Dali painted bread-symbol with a double and triple bottom, bread-provocation. Bread that will never be eaten, because it was not originally intended for food, but was conceived and embodied by the master exclusively as an art object. But on this linen the bread is quite realistic. A similar picture of Dali painted one more time, in 1945. On a dark, saturated background, which evokes the thoughts of still-lifes of old Dutch, lies a crumpled white tablecloth. The texture of the fabric, the soft curves of its folds, the shadows that dye the white fabric in the color of ivory – all this is drawn very carefully. The picture resembles a photograph with artificially increased sharpness. On the tablecloth there is a basket of elegant outlines, woven from straws, with curved twisted handles. In it lies a crumpled napkin and four slices of bread, two of which are smeared with oil. This still life, on the one hand, is extremely laconic, but on the other hand it is saturated with an incredible number of small detailed details. The combination of these two factors fascinates and attracts the eye. The triumphant aestheticism of simple things in realism is the same “brand name” of Dali, as crutches and soft clocks on his avant-garde paintings. 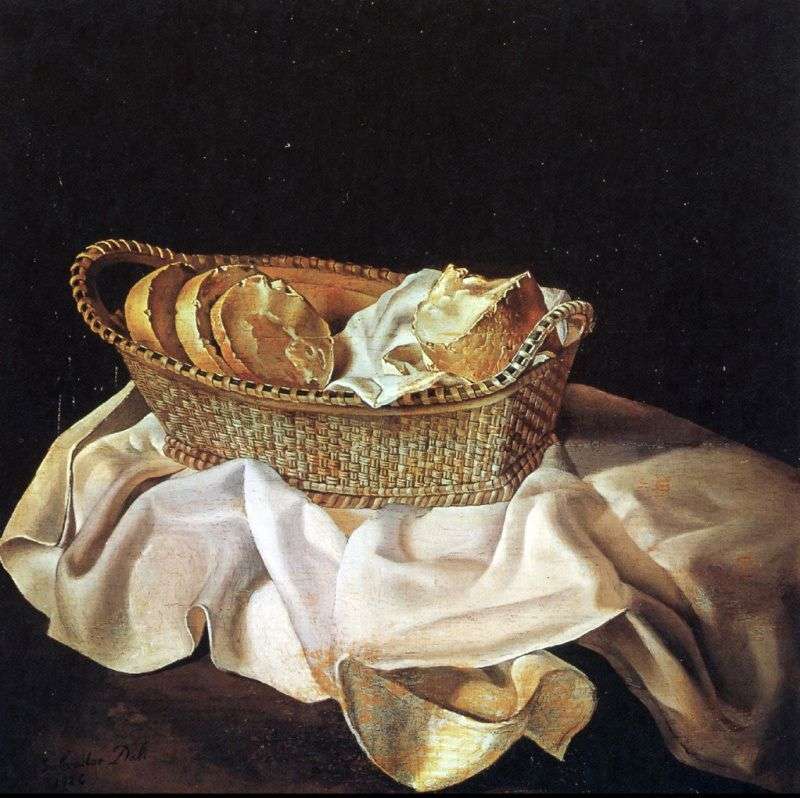 Description and meaning of the painting Basket with bread by Salvador Dali.